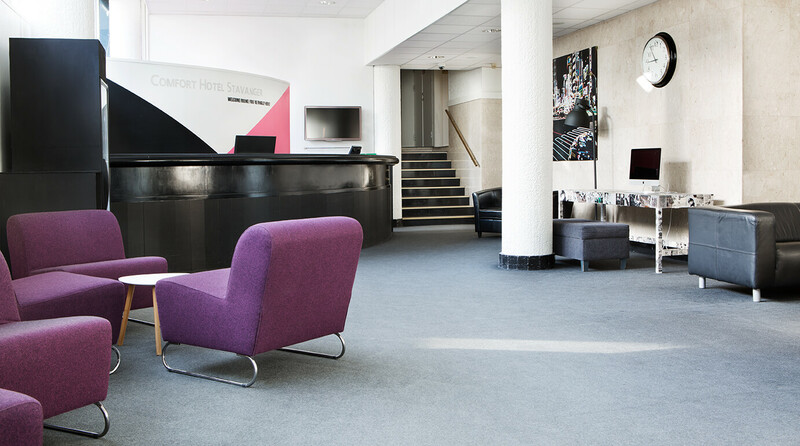 The Comfort Hotel Stavanger is located in the heart of the city, just 20 minutes from Stavanger Airport Sola. There are plenty of shops and restaurants within walking distance, and the central train station is only 400m away. We are a cash-free hotel. Standard single rooms (approx. 12 m2) in a classic Scandinavian style with a comfortable single bed (90 cm wide), desk, armchair and TV. The rooms face a quiet side street. Standard double rooms in a classic Scandinavian style with a double bed, desk, armchair and TV. Standard double rooms in a classic Scandinavian style with two single beds, desk, armchair and TV. Our spacious superior twin rooms are 25-30m2 in size, featuring a sleeping area with two single beds (90cm each) that can be pushed together to make a double bed. Rooms are also equipped with a sofa bed, desk, chair and TV. The deluxe double room is our most luxurious room type. The room features a double bed (180 cm wide), a sofa suite with armchairs, TV and desk. The deluxe rooms are a spacious 30-35 m2.